The modern and comfortable atmosphere in the spa complex is ideal for all guests seeking rest and relaxation. A swimming pool and a fitness center are available free of charge. 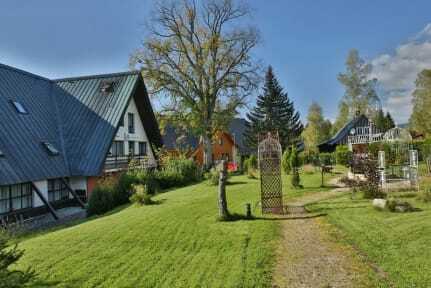 Harrachov can be found in the most popular Czech mountains Krkonoše where the skiing tradition, Czech glass and production of beautiful jewelry inlaid with garnets was born. The hotel offers good facilities for corporate events and all-day entertainment programs. Around Harrachov is a network of bike paths, hiking and cross-country trails that cater to beginners and advanced athletes. 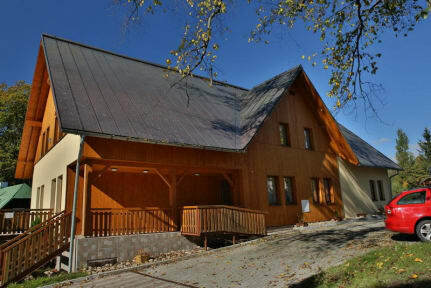 The location of the Hotel Harrachovka is in a quiet and green part of Harrachov that creates a relaxed atmosphere. Hotel Harrachovka is completely non-smoking, there are places reserved for smokers. All rooms are completely furnished. There is an extensive wellness center, a swimming pool 8 x 4 m, salt-cave, steam bath, infrared sauna, fitness (exercise bike, orbitrek, treadmill, gym balls etc. ), vibration platform. Cancellation policy: 10 days before arrival. The remaining amount of the reservation will be charged on arrival date of the booking by Click and Book Travel.